Multnomah County library cardholders can now watch six movies a month online via Kanopy. Whether you always read the book first — or just want to watch the movie — the Multnomah County library has you covered. As of Oct. 1, library patrons now have free access to 30,000 films via the online streaming service Kanopy. Current listings include everything from the classic melodrama "Breakfast at Tiffany's" to horror hit "Let the Right One In" or cult favorite "Harold and Maude." To access the site, library card holders should click here and create an account with a username, email and password. After verifying the account by email, the final step is to register your unique library card number (printed on the back of the card) and your PIN. If you don't have a library card yet, you'll need to make the trek to one of the system's 19 branches. 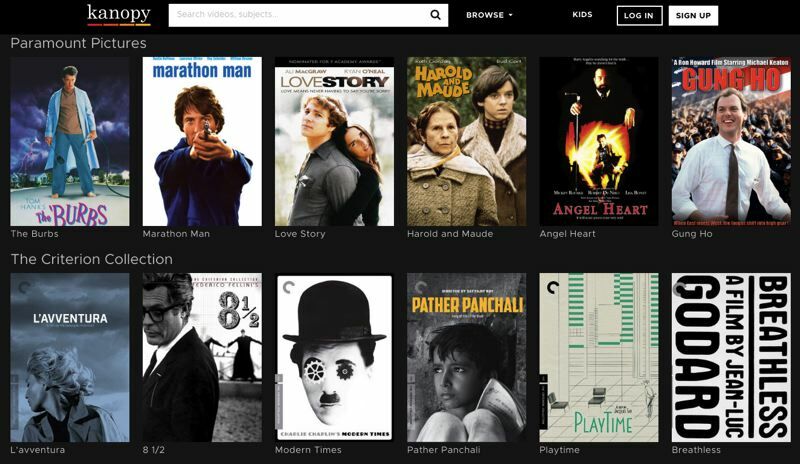 "Patrons have been asking for this service by name weekly for the past year and the library is delighted to be able to offer Kanopy to the community of Multnomah County film lovers," Electronic Content Librarian Kady Ferris said in a statement. Kanopy probably won't keep local binge-watchers sated for long. Multnomah County, which must shell out a few bucks to Kanopy for each viewing, is currently offering users access to six movies a month. Users will have three days to watch each film. The on-demand service is also available to viewers on TVs, computers or mobile devices by downloading the Kanopy app for iOS, Android, AppleTV, Chromecast or Roku. Cinema snobs won't be displeased with a selection that includes numerous documentaries, film festival standouts, indie masterpieces and other obscure titles. Some of the films come from the Criterion Collection, PBS and other independent filmmakers. Added librarian Ferris: "We think patrons will enjoy the breadth and depth of video offerings, the smooth user experience, and the high number of apps and devices through which patrons can access the collection." For ebooks, audiobooks, music and other electronic offerings, click on this link. Happy streaming!